We're a Halloween costume company, so you all can understand when we think that Halloween should really be a banking holiday. People should be able to prepare the costumes for their children and themselves all day not to mention skull-decorated cupcakes and ghost detailed cookies. It takes a long time to curl a wig and put together a meticulous mustache. Here's the thing, that's why we're here. We're here to make sure that, even if you're working past five with only hours of Halloween evening in your grasp, you still deserve to have a festive costume! Don't back down when it comes to All Hallows Eve, after all, this holiday only comes round but once a year! Maybe you are encouraged to wear a costume to work or maybe your look can't be compromised in any way. If you're allowed to wear costumes to work, this will look lovely and colorful layered with dressy leggings and nice shoes, while being festive enough for a party after five. If your professional look is set in stone, fold this poncho up in your bag and throw it on when you're free. 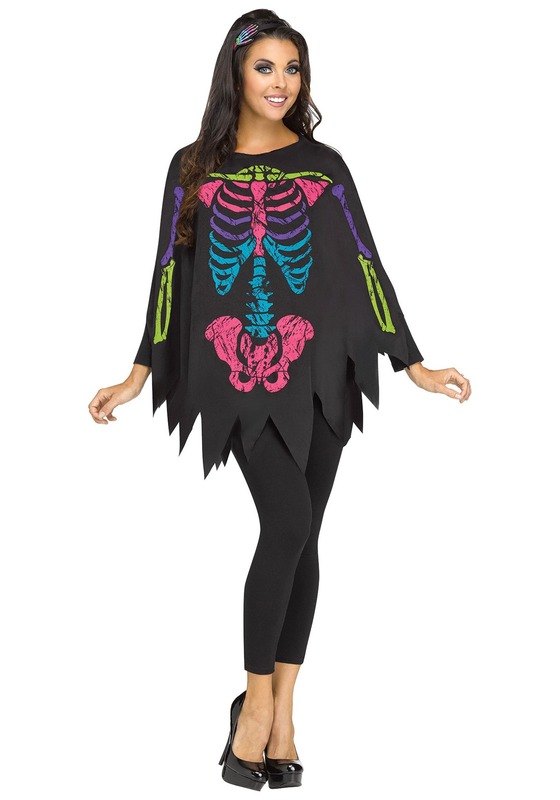 Its colorful look will help you instantly transform into a bone-a-fide skeleton. If you're ready to get the Halloween celebration rolling then you'll need to throw on something that's as festive as you deserve. If you're looking to amp this lookup, pair it with a matching rainbow wig or a pair of skeleton leggings, and you'll feel ready to take part in your local monster mash. So even if you're going to have to work late this Halloween, keep your cool. When you've got a costume as simple as this one, you'll be mamboing with the ghouls and goblins in mere minutes!